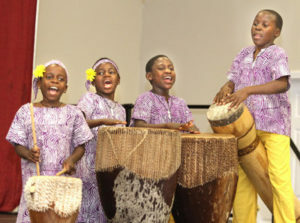 From the white sandy beaches of Florida to the snow covered mountain peaks of Washington state, American audiences have experienced the thrill of the music and dancing of the Ugandan Thunder, a nationally acclaimed choir consisting of 22 multi-talented children. The choir members range in age from eight to thirteen, and are from the Royal School and Orphanage located in Uganda, East Africa. The Royal School is ranked among the top ten schools in all of Uganda. The choir has been in the US for nearly a year, traveling, singing, and serving as ambassadors for their orphanages and school. The Ugandan Thunder Choir will sing some of your favorite songs both in African and American styles. The concert is packed with high energy music, dancing, native costumes and instrumentation, and interaction with the audience. There will be something for every member of the family. Although these children come from one of the poorest countries on the planet, and some of the most challenging family situations—often losing both parents either to disease or war—you will be amazed at the genuine joy and peace expressed in their young lives. The Ugandan Thunder will be appearing at O’Fallon First United Methodist Church, 504 E. U.S. Highway 50 on Monday, October 3,2016 at 7:00pm. The is no charge, but a freewill offering will be taken for the choir during the concert. The concert is scheduled to last one hour. Childcare will be provided, and the church is handicap accessible. The Ugandan Thunder is sponsored by Pennies for Posho, a non-profit Christian ministry that provides food, clothing, shelter, education, and clean drinking water to eleven orphanages in Uganda. You can read more about this ministry at: pennies forposho.org. This is not just a concert. This could be life changing!